A signature social program of Adopt-a-Bubbe is the warm home day centers, which are held in the apartments of participants. Adopt-a-Bubbe currently operates two warm homes in Dnipropetrovsk (one on each side of the Dnipr River) and 12 others in its broader service region. Twelve to 15 seniors attend each warm home every month, with some people rotating in or out each session so that more individuals are able to participate. With financial assistance from AAB, the hostess and other participants purchase food for a full hot meal; both the hostess and some guests prepare the dishes so that the hostess is not overwhelmed and more people feel valued. In addition to consuming a hot, nutritious meal, participants celebrate birthdays and holidays, sing, dance, watch videos, and take part in other activities. The opportunities for socializing and for intellectual exercise are just as important as the hot meal, said Mr. Sidelkovsky. Mr. Sidelkovsky acknowledged that the Joint Distribution Committee had initiated the warm home program and then abandoned it as a consequence of budgetary pressures. Mr. Sidelkovsky stated that the need for AAB services has grown as inflation continues to erode purchasing power and the Joint Distribution Committee continues to reduce assistance to Jewish elderly and other Jews in need. Additionally, noted the Sidelkovskys, Adopt-a-Bubbe is badly in need of new office and storage space. Their existing premises, in the semi-finished basement of the Golden Rose Choral Synagogue, were badly flooded during the initial construction of the Menorah Center; some supplies were destroyed, and the atmosphere remains unpleasant. However, said Mr. Sidelkovsky, the opening of the new Jewish Medical Center (see above) has been a real “blessing” for the Jewish community in an otherwise trying time. AAB clients are referred to the Center, where they receive excellent care previously unavailable in the city. 15. The writer was unable to visit Ahavat Israel, an organization initiated in 2011 to bring Jewish life to Jewish deaf and mute individuals in the city. Established with the endorsement of Chief Rabbi Shmuel Kaminezki, the group reaches out to the approximately 20 deaf Jews in Dnipropetrovsk, almost all of whom know each other because they attended either of two public schools that service children with hearing disabilities. All use sign language that was taught in these schools and almost all are employed as seamstresses or factory workers, skills that were deemed appropriate for this population group. 16. Rabbi Shmuel Kaminezki is the Chief Rabbi of Dnipropetrovsk and is regarded by most observers as the most effective community rabbi in all of the post-Soviet successor states. He has built an unparalleled community infrastructure, deftly raising and managing funds from wealthy local Jews, foreign donors, international Jewish organizations, and the Boston Jewish community with which Dnipropetrovsk Jewry enjoys a twinning or sister-city relationship. Determined to maintain a Chabad monopoly on Jewish religious practice in the city, he welcomes non-Chabad Jewish organizations that eschew forms of Jewish religious education or expression that contradict Chabad observance. In response to questions from the writer, Rabbi Kaminezki stated that critical Western press assessments of political and economic developments in Ukraine were generally accurate. The “atmosphere” is not good. President Yanukovych hoards power, and print media appears censored [often by the media owners themselves as a form of self-protection]. Some people are apprehensive about speaking out, and a general sense of tension exists. However, the Internet carries open criticism of President Yanukovych and of Yanukovych’s son. 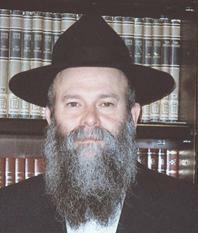 Rabbi Shmuel Kaminezki, a native of Israel, is widely consid-ered the most accomplished community rabbi in all of the post-Soviet successor states. He has been Chief Rabbi of Dnipropetrovsk, a city of great importance in Chabad history, for more than 20 years. Economically, various pressures on business generate strong adverse consequences and deter business growth, said Rabbi Kaminezki. Associates of Yanukovych continue to confiscate businesses that they desire, demanding 50 percent ownership without any compensation to the legal title-holder. Such actions have occurred in a number of different cities, including Kyiv, Odesa, Donetsk, and Zaporizhya. Confiscations have not occurred in Dnipropetrovsk, stated Rabbi Kaminezki, attributing this good fortune to the skills and determination of the oblast (region) governor, Oleksandr Vilkul. Nonetheless, Rabbi Kaminezki continued, local business owners remain concerned about potential business losses and their ability to expand into other regions. Another matter of concern to business owners, said Rabbi Kaminezki, is a tax code that is punitive and enforced capriciously. It is unlikely that anyone pays all tax assessments, he continued, because no one can afford to do so; however, local tax authorities are very aggressive and all businesses feel enormous pressure. Customs duties, he added, are extraordinarily high, deterring trade and depriving businesses of materials and equipment needed for general operations and expansion. All of these issues [plus the corrupt legal system] combine to discourage business growth, summarized Rabbi Kaminezki. The International Monetary Fund and the World Bank have severely criticized financial practices in Ukraine; foreign investors are frightened about business development in the country, fearing its massive corruption, business confiscations, excessive taxation and customs charges, and lack of legal protection. Local individuals share the same fears. Consequently, business is stagnating, if not actually declining. Unemployment is growing; especially noticeable, said Rabbi Kaminezki, are dismissals of individuals who populate the once-growing middle class. Dnipropetrovsk actually is suffering less in the current business climate than other areas in the country, stated Rabbi Kaminezki, because the oblast and city governments work hard to maintain a business-friendly environment. Nonetheless, local businessmen are not oblivious to the situation around them and most now are very risk-averse. Investment has declined. People are waiting and watching, hesitant to commit large sums of money to business development. Obviously, this atmosphere has had a serious impact on fundraising for the needs of the Jewish community. About 90 individuals are members of the Board of Trustees (Попечительский совет) of the Philanthropic Fund of the [Chabad] Dnipropetrovsk Jewish Community (Благотворительный фонд Днепропетровского еврейского общины), said Rabbi Kaminezki. The official minimum contribution for Board membership is $1,000 monthly, he continued. If individuals are struggling financially, they pay what they are able to contribute in a given month; the Board does not “push” people who encounter difficulty, but all members are expected to fulfill their obligations eventually, Rabbi Kaminezki averred. As in other countries, many Jewish donors prefer to “follow their money” and contribute heavily to designated projects that they “own”, rather than commit very large sums to the Philanthropic Fund. Thus, individual donors are financing the Menorah Center and the new buildings for Beit Chana. A pledge has been obtained from another benefactor to cover the operating costs of the proposed yeshiva katana for boys from Chabad families (see below) and Rabbi Kaminezki is seeking designated funding for development of the actual yeshiva premises. An individual donor contributes $300 monthly specifically to help diabetes patients obtain high-quality insulin and appropriate food, and yet another local Jew is providing significant assistance to cancer patients. Rabbi Kaminezki continues to receive individual local Jews in his office every week, many of whom are seeking financial assistance for medical care. Usually, he said, 60 to 70 people come each Sunday between 9:30 a.m. and 2:00 or 3:00 p.m. Two assistants manage the flow of petitioners and follow up on recommendations. Cash may be disbursed for specific purchases, and referrals are made to the Jewish Medical Clinic for evaluation or to other organizations. All financial aid for medical care is coordinated with the local office of the Joint Distribution Committee; sometimes Chabad and JDC share expenses in funding surgery, medications, or other medical needs. On its own, Chabad operates several welfare programs, stated Rabbi Kaminezki. It continues to provide hot lunches to 50 to 60 people daily in a dining room located in the old synagogue. It also distributes food parcels to needy Jewish elderly and to some impoverished families. Another ongoing project is the renovation of dilapidated apartments in which Jews live; in the cases of elderly Jews residing in such units, renovation of their homes may delay their entry into Beit Baruch, a far more expensive form of assistance. Aware that elderly Jews ineligible for Claims Conference funds receive much less JDC aid than their counterparts who lived under Nazi occupation, Chabad splits the cost with JDC of support that equalizes care for the two groups. 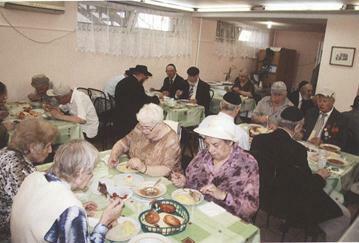 Elderly Jews are served lunch, the heaviest meal of the day, in the lower level of the old Chabad synagogue. Photo: ЕВРЕЇ ДНІПРОПЕТРОВЩИНИ: історіа та сучасністью. (Дніпропет- ровськ: Арт-Прес, 2011), 65. JDC has reinstated a limited warm home program, sometimes providing only tea and cake to participants. On other occasions, commercially pre-cooked food items are served. The Sidelkovskys maintain that actual preparation of a meal is critical to maintaining a sense of self-respect among elderly participants. The cost of ingredients for such a meal varies from city to city, said Ms. Sidelkovsky, but AAB usually budgets about $50 per meal. Often, individual guests will bring several bottles of wine, some chocolates, or other treats on their own. Viktor Yanukovych’s older son, Oleksandr, nominally a dentist, has become one of the wealthiest individuals in Ukraine since his father assumed power. In response to a question, Rabbi Kaminezki said that no Jewish community property has been seized during this wave of confiscations. It appears that synagogues, schools, and other Jewish-held buildings are “immune” from seizure, he said. Rabbi Kaminezki did not mention another deterrent to business, the corrupt legal system that prevents, for example, business confiscations and other abuses from being challenged. Rabbi Kaminezki’s assessment of the relatively favorable business environment in Dnipropetrovsk is shared by diplomats and other observers in Kyiv with whom the writer has conferred. The Conference on Jewish Material Claims against Germany (known as the Claims Conference) provides welfare assistance through the Joint Distribution Committee to Jewish elderly who lived in areas under German occupation during World War II. Individuals who were evacuated to regions beyond enemy occupation are ineligible for such aid, as are others who were born after the end of the war.